Bangladesh and Afghanistan are placed into group B in ongoing season of Asia Cup 2018 where their other groupmate is Sri Lanka. 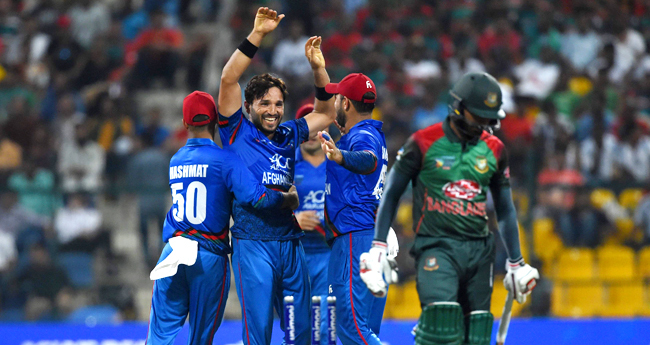 Bangladesh and Afghanistan both defeated the Lions earlier and so, this two teams confirmed their place into playoff round. So, in the 6th match of the tournament which was the 3rd ODI in group B, Afghanistan faced Bangladesh. Team Bangladesh did not use the best eleven because they have an another match just the day later. So, they gave rest to their top rated couple of players. As a result, they failed to get victory against Afghanistan where team Afghanistan won by 136 runs against the Tigers. Bangladesh is still couple of steps ahead than Afghan cricket team and they are standing on the 7th position on ICC ODI ranking. On the other side, team Afghanistan is standing on 10th position so far. As the member of Asian Cricket Council, both of them got chance to play in Asia Cup 2018 and it seems that they are worthy enough to move to the playoff round. Bangladesh cricket team skipper Mashrafe took the match so lightly and so, the team suffered. Afghanistan won the toss and decided to bat first. Earlier, they took bat against the Lions and won the match. The match between Bangladesh and Afghanistan took place in 20th September, 2018 at Sheikh Zayed Cricket Stadium, Abu Dhabi. The Tigers had Mustafiz but they gave him rest. So, bowling line up was getting weaker and they gave much runs to the Afghan team. For the Tigers, Abu Hider and Nazmul Hossain Shanto made their ODI debut there. Team Afghan played quite well in the match and scored 255 runs in exchange for seven wickets. They played complete fifty overs so far. On the other side, Bangladesh lost all wickets scoring 119 runs. They faced batting collapsed there and played 42.1 overs. Mohammad Shahzad and Ihsanullah started the innings for the Afghan team but in 10 runs, Ihsanullah was gone. He scored 8 runs in just 4 balls so far. Just 18 runs later, 2nd wicket was gone as well. It was Rahmat Shah who scored 10 runs. But the opener Shahzad scored 37 runs and his 3rd partner Shahidi scored 58 runs so far. Gulbadin Naib and Rashid Khan added 42 and 57 runs respectively and both of them remained not out. They played complete 50 overs and scored 255 runs in exchange for seven wickets. Shakib Al Hasan took four wickets and debut player Abu Hider took 2 wickets so far for the Tigers.